Hason Raja literally Hason the king, was a mystical poet and songwriter in Bengal, now Bangladesh. Born at the end of the 19th century 1854 to a traditional Zamindar or landowner family near Sunamganj, Sylhet, though his anchestral home is in Rampasha, Biswanath, Sylhet. Hason indulged himself in material pursuits in his youth. Later, he came to believe worldly pleasures are meaningless and wrote songs that have been described as some of the most thoughtful songs, touching the deepest emotions of the human mind. Hason's father, Dewan Ali Raja (Choudhury), was a direct descendant of the Hindu king Raja Birendra Singhdev, (who later converted to Islam and became known as Babu Khan). Hason's mother was Ali Raja's second wife, Huramat Jahan Begum. As befitted Hason's ancestry, he was tall, handsome and charming, with a regal manner and dress sense. Hason's elder half-brother, Ubeydur Raja, died when Hason was a teenager. The death of Ali Raja, about 40 days later, meant Hason became responsible for overseeing his father's vast property at an early age. Despite his youth when taking on this responsibility, he proved to be a very successful Zamindar, acquiring acres of land and many properties in Sylhet. Yet, despite his financially privileged upbringing, Hason is credited with setting up a number of local schools and religious organisations, and is said to have frequently provided for the poor and needy of his community. Hason Raja had four sons, Khan Bahadur Dewan Ganiur Raja, Hasinur Raja, Khan Bahadur Dewan Eklimur Raja Chowdhury (Kabbo Bisharod) and Aftabur Raja. Dewan Eklimur Raja followed in his footsteps and also wrote poetry and songs; he was also known as the architect of modern poetry of Sylhet area. Dewan Hason Raja donated one third of his property as Waqf in 1918 for the well being of the people and offsprings of his beloved son Eklimur Raja. Hason Raja's songs are in the folk tradition of Bengal that seeks the ultimate truth beyond the material world. They include songs such as 'Lokey bole', published in his book of songs, Hason Udas. In recent times, they have been modernised and are very popular in both Bangladesh and West Bengal. Many book has been published so far on great mystic poet Hason Raja. Hason Raja died in 1922, years before his contribution to the poetry of Bengal was mentioned in lectures at Oxford University by Nobel poet laureate Rabindranath Tagore. 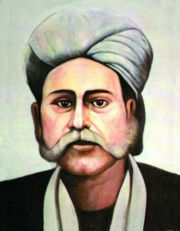 Hason Raja is also known as Dewan Hasan Raja. A beautiful museum namely, Museum of Rajas' has been established in his anchestral home at Raja - Kunjo, Sylhet, Bangladesh; where historical exhibits of Hason Raja, Eklimur Raja, Talibur Raja, (grandson) and other respected Rajas' are displayed. The sponsors of this spectacular Museum is 'Educationist Dewan Talibur Raja Trust'. People say, they say I have no house built. But how long will I stay for? I see gray hair that I have. Hason Raja hasn't built a house.